She loves her tiny table all for herself. The dining table is buzzing with adult conversation that does not interest her. She prefers looking out and getting lost in her own world: it is easier to do that from where she is placed. She plays with the streamers and keeps looking out as she waits, watching the big Jamrool tree offer shade – the shadows shimmering in patches or forming arbitrary pattern on the ground, the leaves swishing in that mellowed but invigorating winter air. What she is waiting for is the heap of caramelized crisp onions on the pile of yellow Mishti Pulao. Dida will serve her first. Hot aromatic pulao and the spicy sauce coated pieces of meat makes every day perfect. The date and tomato chutney will come later and finally the bejeweled slices of fruit cakes that got baked the niight before. And I still do. I still have my Mishti Pulao with caramelized onions heaped on the top. 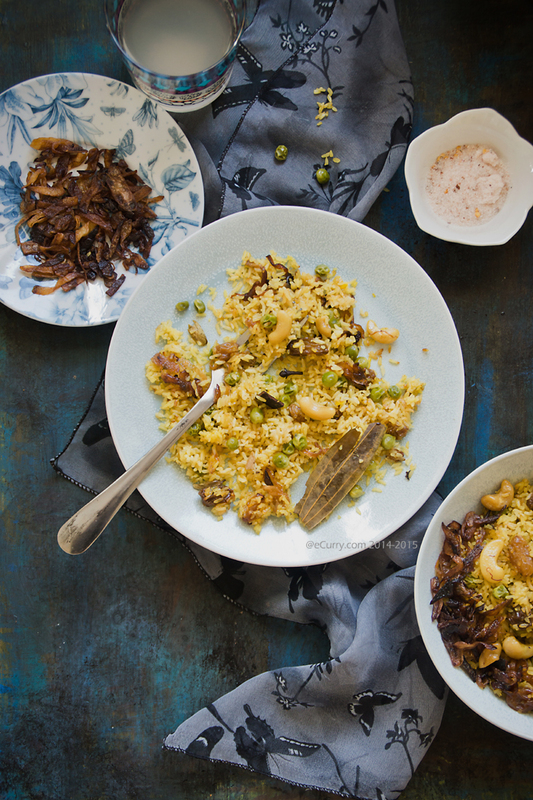 Mishti Pulao or Pilaf with cashews and raisins with a slight hint of sweet is a very traditional Bengali dish. Served with a spicy meat curry, as it usually is, the flavors of the spices, ghee and Gobindobhog rice together is an unforgettable riot. The pulao/pilaf is almost always served as a part of the traditional wedding meal, or any other significant celebration. Always with a spicy side. My favorite has been with Kosha Mangsho or braised meat. 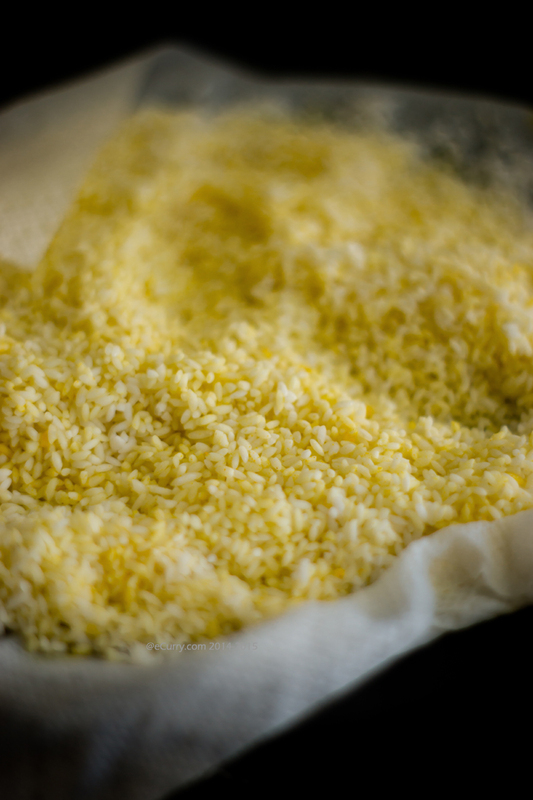 Cook the rice in ghee along with everything else until the grains are coated and they start to glisten. Only after that, add water for final cooking. However I have to admit that I need no sides with this. 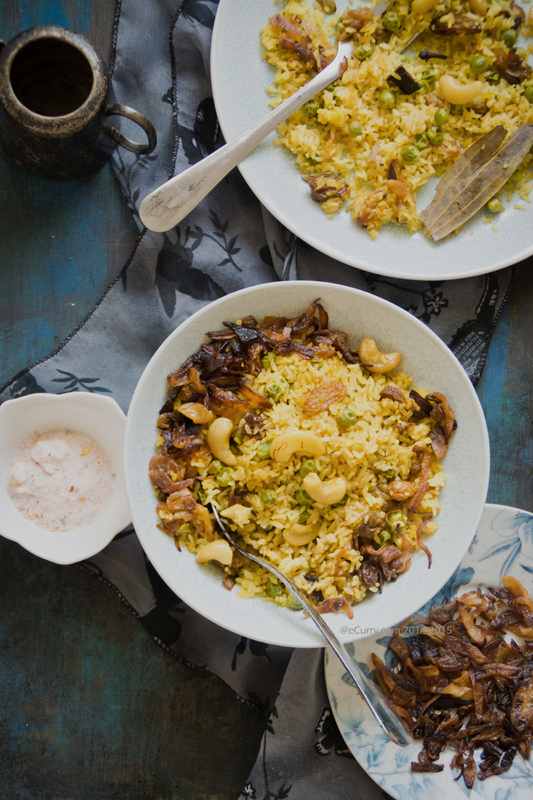 The amalgam of flavors and the texture of the nuts, the sweet raisins and the perfectly cooked rice with each separate grains makes it a dish to love by itself. Every family has traditions and ours, or rather mine was to have Mishti Pulao with caramelized onions and Kosha Mangsho for Christmas lunch at my grandparents. I do not have distinct memories of any other days that I had mishti pulao, that I savor, like this particular day. I have had it this way for many years. For as long as my grandparents lived in that house. 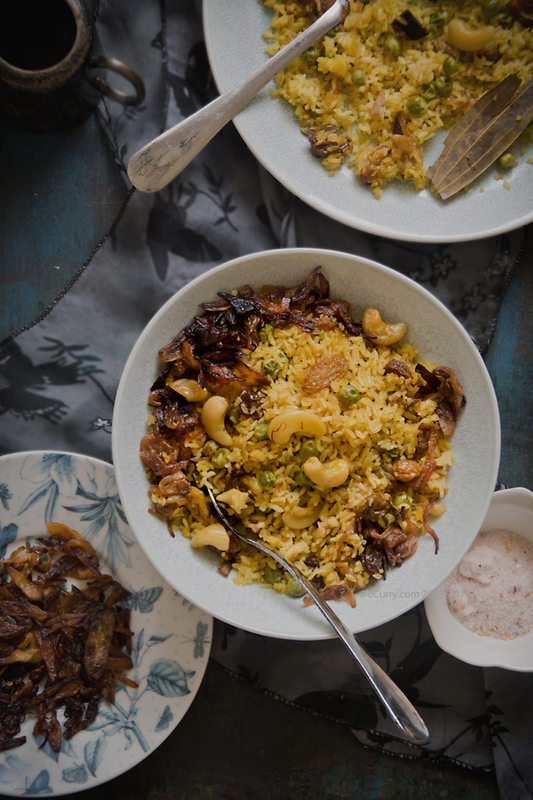 Then there are those wedding meals (including my own) when I did wait for the Mishti Pulao with the golden fried cashews and sweet plump raisins, but they never did have the fried onions. 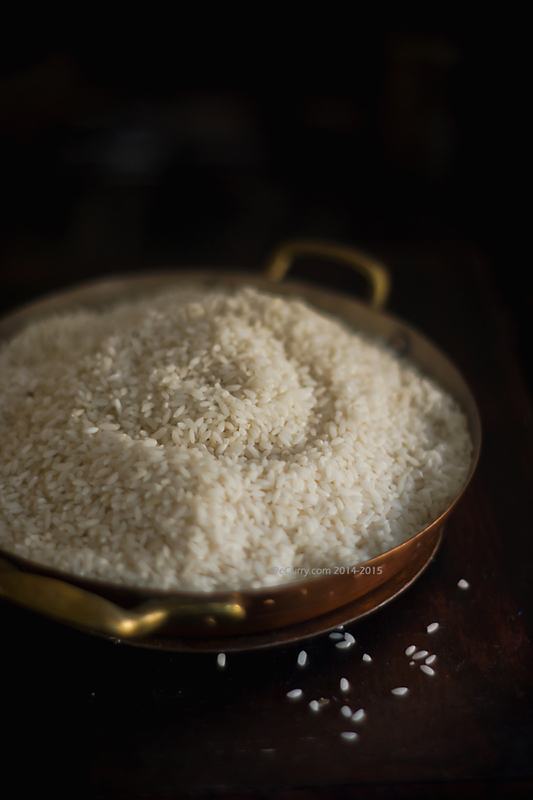 Very aromatic, short grained Gobindobhog Rice. Grains of Gold for me. 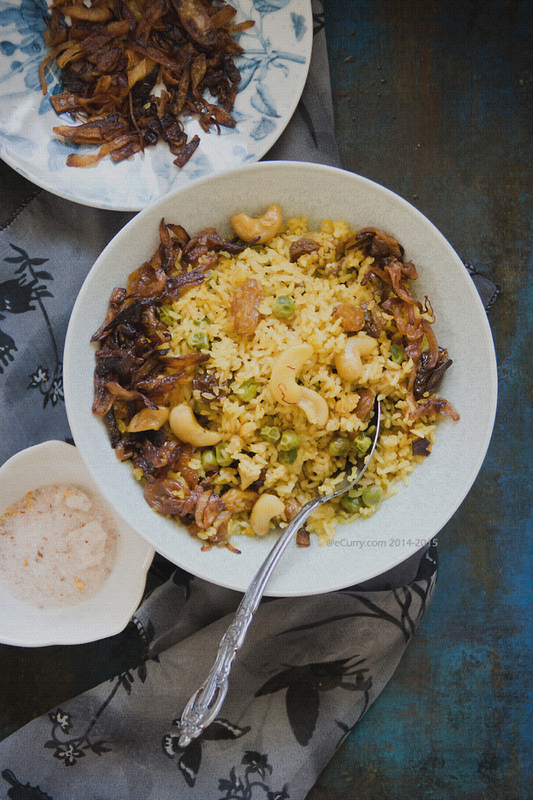 Slowly caramelized onions do add another level of flavor to this dish but what is most important is the use of the Gobindo bhog rice. 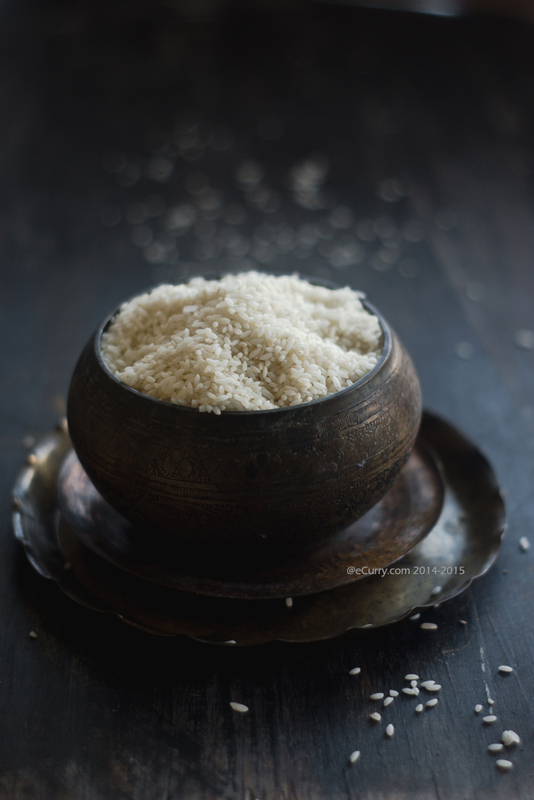 It is a very fragrant short grain rice used in Bengal for this pulao and also for Payesh or Kheer (Rice Pudding). I get the rice from India. Each grain is a grain of gold. I have not found this rice in anywhere here. I do think using good quality Jasmine rice works for this recipe and so does Basmati. Mishti in Bengali means sweet. Isn’t everything about a Bengali, sweet? Holidays are coming up. I am sure this will make a sweet addition to any holiday table! Note: the caramelized onions are optional. 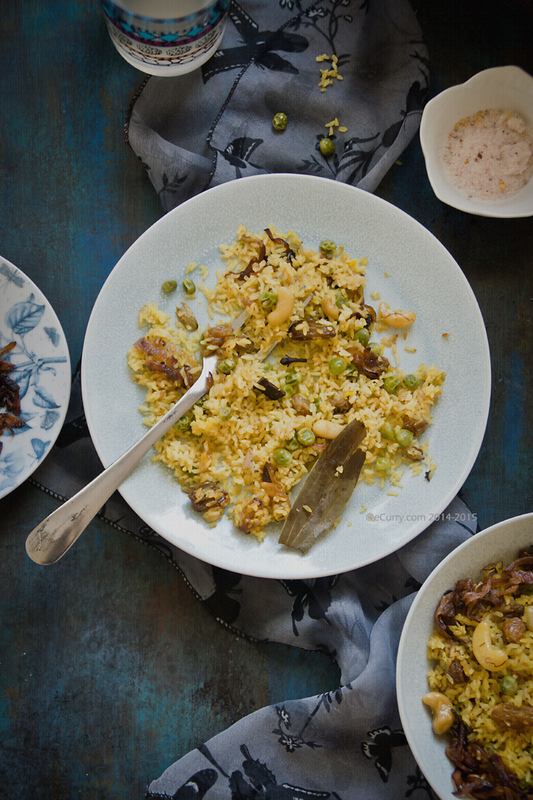 The Mishti Pulao can be made without the onions and hence done the satvic way. 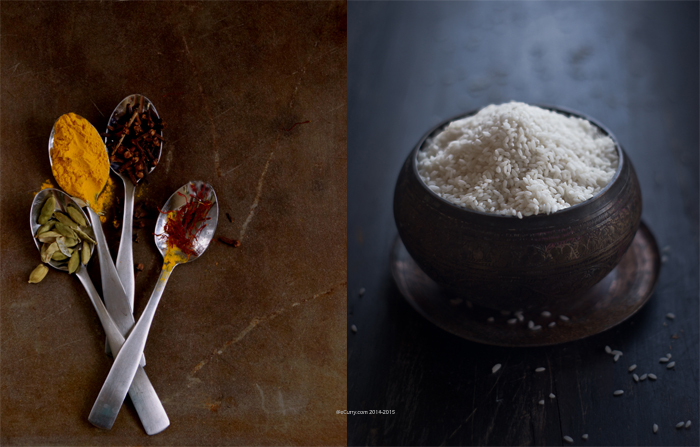 However if you add them, they do add a deep and rich flavor to the pulao/pilaf. (If you going to be using onions, slice the onions in thin half moons. 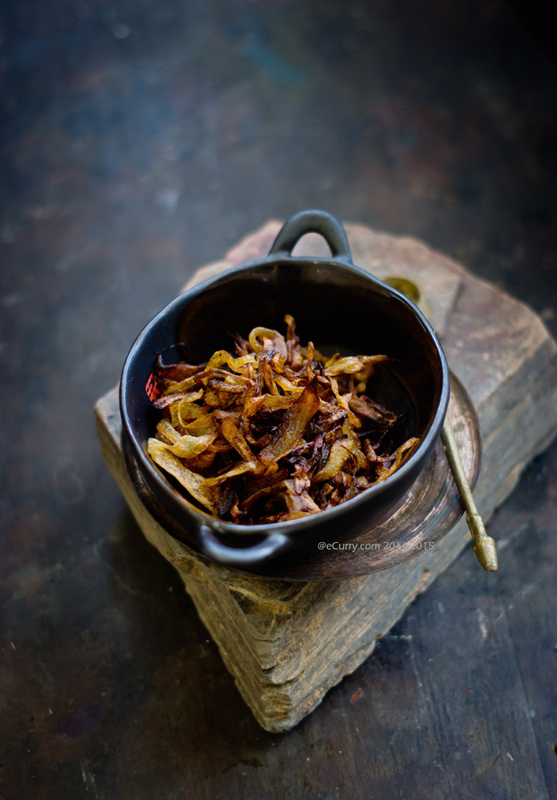 The traditional Beresta or the crispy caramelized onions require quite a bit of oil or ghee for them to crisp enough to be stored for a long time. I have used way less ghee/oil here. So you have to take even more care not to burn it if you are doing it this way. Pound the cardamom, cinnamon and clove until they break in small pieces. In a thick bottomed pan add ghee: when the ghee warms up, add the cardamom, cinnamon, slit green chilli pepper if you are using and the tejpatta/Indian bay leaf. When the spices sizzle, add some freshly ground black pepper. 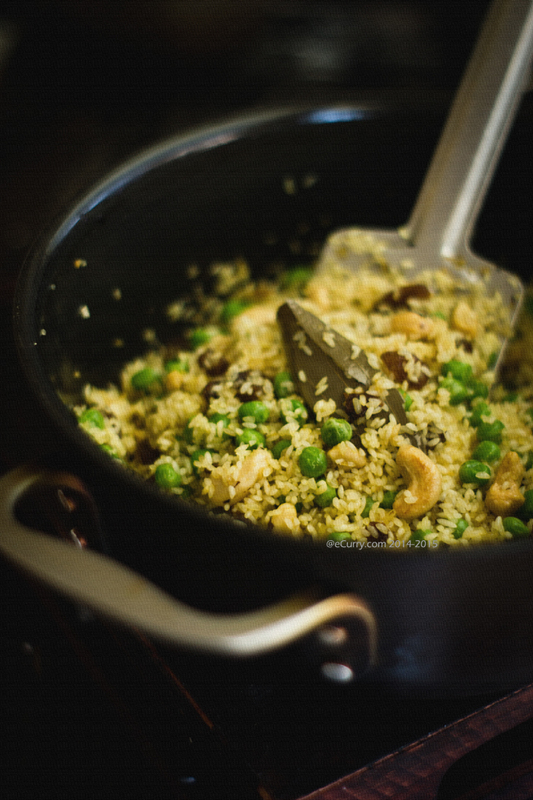 Now add the cashew, (almonds if you are using) raisins, peas if you want. Stir and toss them for a while. Now add the salt and the sugar along with the washed and dried rice. Add the grated ginger and the mace. Toss everything together and cook at medium heat for the spices to infuse the flavors and for the ghee to coat the rice and everything else. After a 3-4 minutes, the rice will start to glisten. While the rice is cooking bring 2.5 cups of water (if you are using Gobindobhog rice. If you are using any other kind of rice, you will have to follow instructions for the particular kind to how much water to use) to a boil. Add the saffron threads if you are using them. Once the rice is well coated with the ghee and spices, add the boiling water to the rice. Cook uncovered at high heat until the water disappears from the topmost level of the rice. There will be still water left in the pot. Now reduce heat to minimum and cover the pot tightly. Let it cook for another 3-5 minutes. Now switch off the heat but keep the pot covered for another 10 minutes. Uncover and fluff rice with fork. You may drizzle some more ghee before serving. The rice can re heated in the microwave. Serve with spicy sides or by itself if you wish. Traditionally the “Mishti Pulao” is served with dishes like Spicy Chicken or Mutton Curry, Bengali Cholar Dal, Aloo r Dum, Maacher Jhal or any spicy dish. 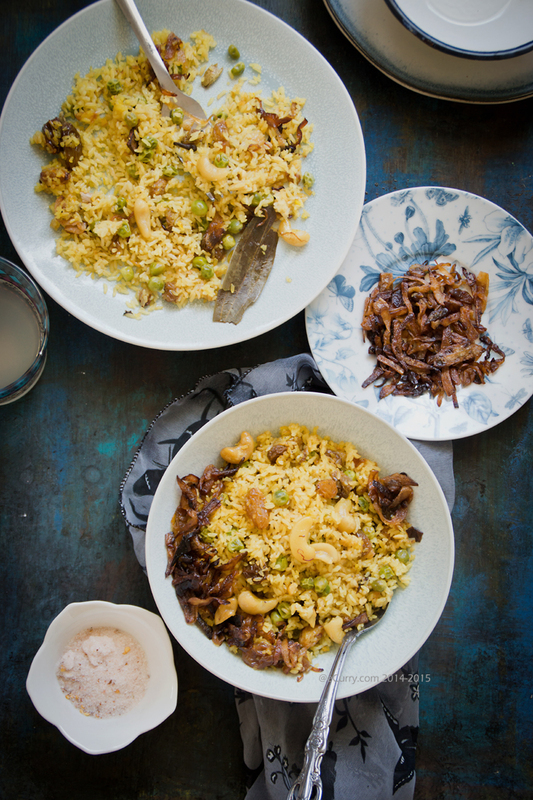 A fabulous rice dish!Mouthwatering looking and so flavorful. Eta ebar banaboi. Oi caramelised onions diye e banabo. Ki shundor dekhte hoyeche … every grain dekhacche. You have a slightly different recipe than the one I use. I never ever use onion with Gobindobhog, I feel like the onion takes away the aroma of the rice. It’s funny to see that as a Bangal, this polao was never made either in our house or in any Bangal wedding I have been to. I think this is a specialty of the Bengalis from West Bengal. I always buy Kaleejeera or chinigura rice from Bangladeshi stores…they are almost similar to our Gobindobhog and the chinigura is very high quality. (I don’t bring rice from India as it’s on the list of things which is prohibited due to kapra beetle infestation :(). I wish I could bring kamini atop, I love that rice. I do not think there are many people who make mishti pulao with onion (esp with gobindobhog rice). This was my thing. My dida had to make the fried onions for me esp on the Christmas day 😀 BTW I am half Bangal and half ghoti 😛 the misthi pulao is a ghoti thing. amar dida r barite hardly hoto except for this one day. anything with mishti is usually a ghoti thing. BTW, I loved the rice and the fried onion pictures. All the rice pictures are so nice. Very calm and soothing. Delicious and colourful looking misti pulao. Wonderfully prepared. Previous FB comments were totally written while drooling over the pictures!! Darun… have to make it ASAP! I agree with Soma.. in our house too, Gobindobhog is considered *niramishi* – hence no onions or garlic with it. Shubho Nababarsho Soma – Have a great year ahead!!! I made this yesterday using OLIVE OIL instead of ghee.